2013 marks the beginning of a new era for 66 year-old Wheal-Grace Corporation. A buying group led by Nancy Salvini along with the third generation of printers in the family; Beth Salvini and Amy Salvini-Swanson, have acquired controlling shares of the museum quality commercial printer. Emil Salvini, who took over control of the business from his father in 1985, will take on the responsibilities of sales and marketing. His wife Nancy, who has been involved in the business for three decades will manage the business as it’s new CEO. Amy and Beth, owners and operators of Wheal-Grace’s sister company, Greenwich Letterpress, located in the West Village in New York City, will maintain minority ownership while Nancy will take over the daily management of Wheal-Grace. “The company will experience no personnel changes,” said Nancy, “Jim Parrinello our outstanding General Manager will remain in place along with our first-class employees.” The change will help transition the business to the third generation while insuring a succession plan for our valued clients and employees. “I’ll work closely with our current management team while Emil will contribute his invaluable marketing skills,” added Nancy Salvini. Amy and Beth will continue to gather management skills as they operate Greenwich Letterpress that will lead to their goal of operating Wheal-Grace. The company structure has not changed so the firm has the same tax ID and corporate DUNS number and all contracts with clients and vendors remain unchanged. “We area third party certified Woman Owned Enterprise- certified for 3 years by the Treasury Dept. of the State of New Jersey noted Nancy Salvini. 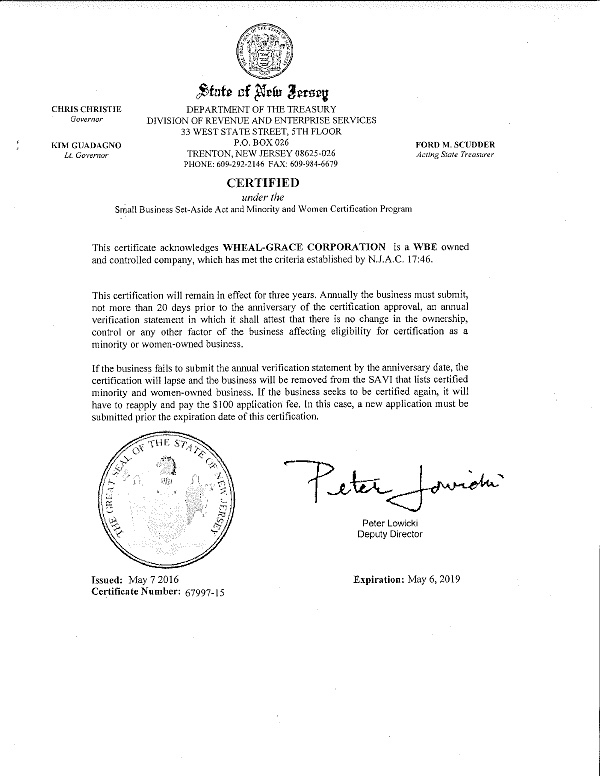 Wheal-Grace will remain a New Jersey Category 3 Certified Small Business. Wheal-Grace is a high quality commercial printer that has been servicing the corporate and advertising community for over six decades with an emphasis on Green Printing. Their facility in Belleville, New Jersey is operated on 100% wind power.